Pro-Israel Brazilian presidential candidate who compared himself to Trump leads as voting begins - but left-wing opponent narrows gap. 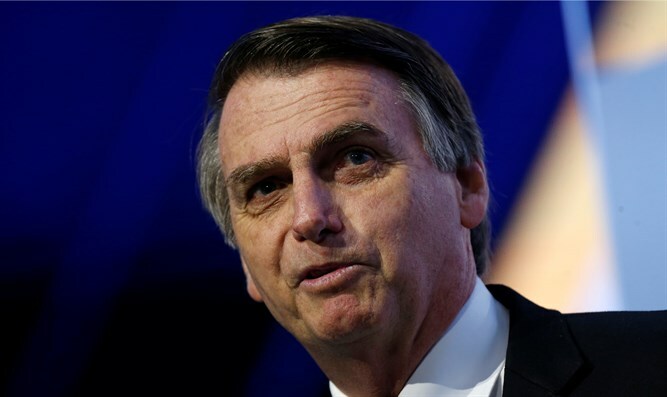 A right-wing Brazilian politician who has compared himself to US President Donald Trump is poised to win the presidency in a runoff election Sunday – though his left-wing opponent has narrowed the gap significantly in the run-up to the vote. Rio de Janeiro federal deputy Jair Bolsonaro, 63, is predicted to lead his Social Liberal Party to victory Sunday, in a race against the left-wing Workers’ Party, headed by former Sao Paulo Mayor Fernando Haddad. The latest Ibope poll, released on Saturday, showed that among voters who had settled on a candidate, Bolsonaro was leading Haddad by eight points, 54% to 46%. But the poll also showed 12% of the electorate remained undecided, with Bolsonaro under the 50% required to secure victory, with 47% saying they were certain they would vote for Bolsonaro, compared to 41% for Haddad. That marks a noticeable decline for Bolsonaro, who led in the previous Ibope survey with 50% to Haddad’s 37%. Among voters who had settled on a candidate, Bolsonaro held a 14-point lead in the previous poll, released last Tuesday, with 57% of the vote to Haddad’s 43%. On October 15th Bolsonaro’s lead was even larger, with 59% of decided voters backing Bolsonaro, compared to 41% who said they supported Haddad. Even with undecideds breaking towards Haddad, Bolsonaro remains the odds-on favorite to win Sunday. A separate poll, conducted by Datafolha showed Bolsonaro with a wider lead, 55 to 45. A third poll, conducted by CNT, gave Bolsonaro a nearly 14-point lead, 56.8% to 43.2%. Bolsonaro, a staunch social conservative who ran on a law-and-order platform amid a massive spike in violent crime, won the first round of the presidential election on October 7th with 46% of the vote to Haddad’s 29%. In the legislative elections, Bolsonaro’s SLP won 52 seats in the lower chamber of the Brazilian congress, a 44-seat increase, while the Workers’ Party fell from 69 seats to 56. A former captain in the Brazilian army, Bolsonaro drew international attention after he compared himself to President Trump and declared himself “an admirer” of the American president. Like Trump, Bolsonaro has vowed to relocate his nation’s embassy in Israel from Tel Aviv to Jerusalem.